The phylum Porifera is a phylum consisting of multicellular organisms which have bodies full of pores and channels allowing water to circulate through them. Organisms from this phylum are tube sponges, yellow sponges, and spongilla. Their bodies consist of a tissue called mesohyl. They have no definite symmetry. Their bodies are multicellular, have few tissues, and no organs. All live attached to something as an adult. They reproduce sexually or asexually. Porifera organisms have no nervous system and have a distinct larval stage which is planktonic. All live in aquatic environments. They are all filter feeders and often have a skeleton of spicules. The Tube Sponge is the most common type of sponge that live in the sea. They breath oxygen and get that oxygen from the seawater. The seawater flows down the tube and through the mesohyl. The mesohyl is the inner tissue of the sponge. The mesohyl functions as an endoskeleton. It is the only skeleton in soft sponges that encrust hard surfaces. The choanocyte cells within the mesohyl tissue absorbs the oxygen that is present in the water. The yellow sponge is commonly found in the Pacific Coastal water of the United States. It is found growing in small colonies. The small pores, called ostia, of the sponge draw water into the sponge. The water is circulated throughout it's body by cells called choanocytes. The choanocyte cells are equipped with flagella. Flagella are whip-like structures that move around and push water through the sponge. As water is swished throughout the sponge, food and oxygen are brought to the sponge while waste and carbon dioxide are removed. Spongilla are freshwater sponges found across North America. The Spongilla is made of many collected channels and chambers squished together so water can move throughout the spongilla. 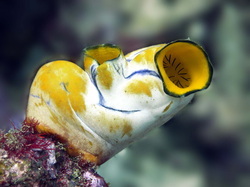 The tissue that makes up the spongilla is called the mesohyl. Small pores, that are called ostia, bring water into the spongilla. The water that flows throughout the spongilla is moved by cells called choanocytes. Almost exactly like a yellow sponge, the choanocyte cells are equipped with flagella. Flagella are whip-like structures that move around and push water through the sponge. As water is swished throughout the sponge, food and oxygen are brought to the sponge while waste and carbon dioxide are removed.